and the Grandmother of Jesus Christ. Hebrew word Hannah, meaning “grace”. of the Mother of God. Her feast is celebrated on 26th July. is called after her name. 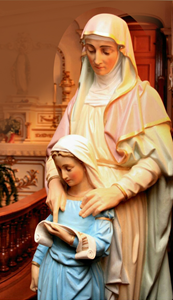 St. Anne is the patroness of our School. St. Anne’s High School is run by the Congregation of Sisters of Charity of St. Anne. It is a minority institution established in 1977 for the girls with English as its medium. In the year 1984 the school opened Marathi Medium as its parallel section for the girls of the marginalized section of our society. The English Medium and the Marathi Medium comprise of 10 standards. In the X standard the girls are prepared for the Secondary School Certificate (S.S.C.) Examination of the Government of Maharashtra. Design & Hosting: Gracetown Worldwide. Copyright © 2011-2016. All Rights Reserved.